To be able to show the appropriate tooltips while the user is moving the cursor around, we need to enable mouse tracking for the widget. For example, the QHelpEvent::pos() function returns the event's position relative to the widget to which the event is dispatched. Here we use this information to determine if the position of the event is contained within the area of any of the shape items. 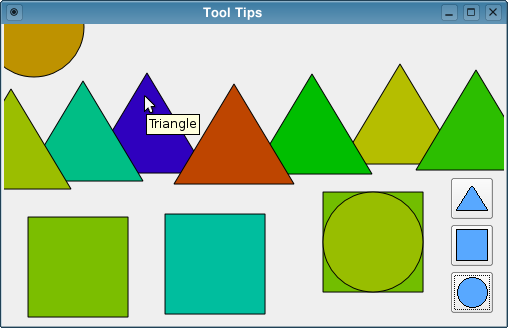 If it is, we display the shape item's tooltip at the position of the event. If not, we hide the tooltip and explicitly ignore the event. This makes sure that the calling code does not start any tooltip specific modes as a result of the event. Note that the QToolTip::showText() function needs the event's position in global coordinates provided by QHelpEvent::globalPos(). The QPainter::setBrush() function sets the current brush used by the painter. When the provided argument is a QColor, the function calls the appropriate QBrush constructor which creates a brush with the specified color and Qt::SolidPattern style. The QPainter::drawPath() function draws the given path using the current pen for outline and the current brush for filling. Whenever the user creates a new shape item, we want the new item to appear at a random position, and we use the randomItemPosition() function to calculate such a position. We make sure that the item appears within the visible area of the SortingBox widget, using the widget's current width and height when calculating the random coordinates. As with initialItemPosition(), the initialItemColor() function is called from the constructor. The purposes of both functions are purely cosmetic: We want to control the initial position and color of the three first items.